9V Backup-Batteri (FÃ¸lger med) og monterings-materiell. - 2 Soner (Trykk pÃ¥ Panikk-knappen og 3 tel. nr. blir ringt opp). (Har du flere montert, vet du hvilken alarm som ringer deg). 1 . Open the battery compartment (14 ) and insert a 9 Volt battery. Close the compartment again . 3 . Set the mode selection switch (9 ) to Alarm or Mute position. 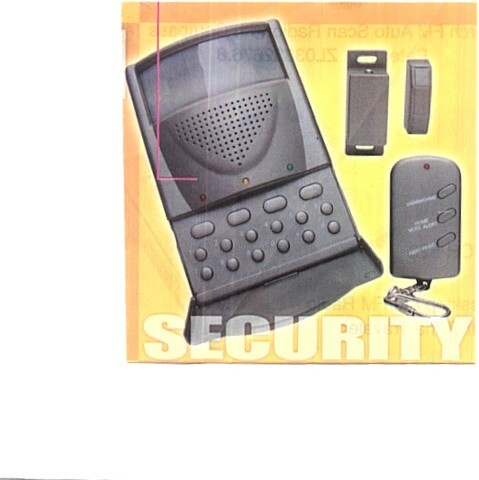 (Alarm Mode = System will activate the dialer and siren when alarm was triggered. 4 . Check your phone system and set the Tone or Pulse position . 5 . Once connected the power, system will go to "Learn Mode " automatically . 6 . Push your remote button once, it will transmission a radio signal to the main unit. 7 . System will respond with 4 beep sound as code learnt confirmation. 8 . If you had 2'nd remote key to learn , then push the "Disarm /chime " button on your 2'nd remote key. 9 . System will leave the learn code after it learnt 2 codes, Or, after first 10 second of power up. 12 . Key in the phone numbers. 13 . Key in the memory numbers. (I.e. M 1 ) . System will respond with a sound as confirm signal . Repe step 6 to 8 to set your 2'nd and 3'rd . phone number. (In case your phone system need to dial digit 9 or 0 to get the phone line . Please include this digit tothe memory setting). 14 . 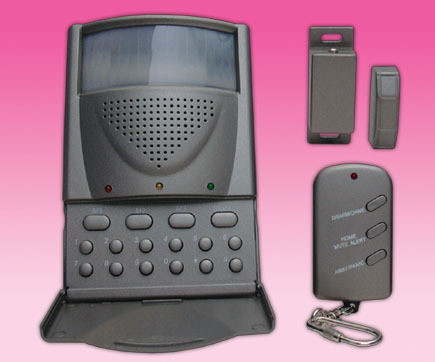 While key in the phone number, the key pad will respond with a short beep sound. (Reset key will clean thememory , then need to entry all the three phone number again). 16 . After program the phone number. System i s ready for use. You could make the selection for the alarm trigger but door closing or opening. Connect the attached magnetic contact to the main unit (10). And put the magnet and sensor together. Connect the attached magnetic contact to the main unit(10). And keep the magnet contact separate. A3. Open the 9 Volt battery compartment, Insert the 9 Volt battery and connect to the battery clip. set the door as "closing"
B1. Slide the "mode selection switch" (9) to the "Prog." Position. B2. Slide the "Tone selection switch"(12) to "Tone" position. B3. Push the number buttons, the keypad should be respond with a single short beep for every button. B4. Push the "STORE" button on the keypad. If your phone system need to dial a digit first for line release, please also key in this digit to your memory. B6. Key in the memory numbers (ie.M1). System will respond with tones sound as confirm signal. Repeat the procedure of B4 to B5 to input the 2'nd and 3'rd phone number. to matching your phone system. once to reset your system. C1. Slide the "Mode Selection switch"(9) to the "Mute" position. C2. Push your remote button once, the remote will send a radio signal to the main unit. C3. Main unit will respond with 4 beeps as learnt confirmation. C4. If you had 2'nd remote, then push the remote button of your 2'nd remote once. Hints: System will leave the learn mode once it receipt 2 codes. Or, after 10 seconds of the first code learning.